Beautiful options for florals that won't make you feel miserable. The bridal bouquet is an iconic part of the wedding day for many women, but it can be an inconvenient one if you have bad pollen allergies. After all, no one wants to be sneezing their way down the aisle! Watery eyes should be because of emotions, not allergens. Sure, there’s medicine, but it doesn’t always get rid of every symptom and can make people’s heads feel cloudy. The wedding day already goes by in a blur – no need to aid it! One way to deal with this issue is to have an unconventional bouquet. Paper, wood, or silk flowers – or even a brooch bouquet – are all options that will keep pollen from affecting your big day. The last few years have shown greenery to be a popular design element, which also gives brides an array of choices. In fact, Kate Upton had more leaves than blooms in her bridal bouquet due to husband Justin Verlander’s allergies. However, if you just can’t shake the vision of carrying a beautiful arrangement of blossoms, there are specific flowers with a lower pollen count that can ease allergy sufferers without sacrificing their dream floral design. Luckily, many of the most popular blooms are already a good choice. Hydrangeas and ranunculuses will both keep pollen-induced sneezing at bay. Because the pollen on orchids is stickier, it typically isn't airborne and thus doesn’t tend to cause the same reaction as other flowers might. Unscented roses will also work, although unfortunately brides with allergies should stay away from garden roses, which are a popular choice. Peonies, on the other hand, should be a safe bet, which is good news for brides hoping for a soft, romantic look. Those looking for more unique blooms for their bouquet will find plenty of options as well. Most varieties of dahlias do not have pollen, while hyacinth, tulips, orchids, and irises can all pack a punch without making you need to pack some tissues. One growing trend in bridal bouquets is the statement flower: one larger, unusual blossom to draw the eye. Particularly for destination weddings, bird of paradise is a wonderful floral choice for that bouquet style, with the added benefit of being allergy friendly. 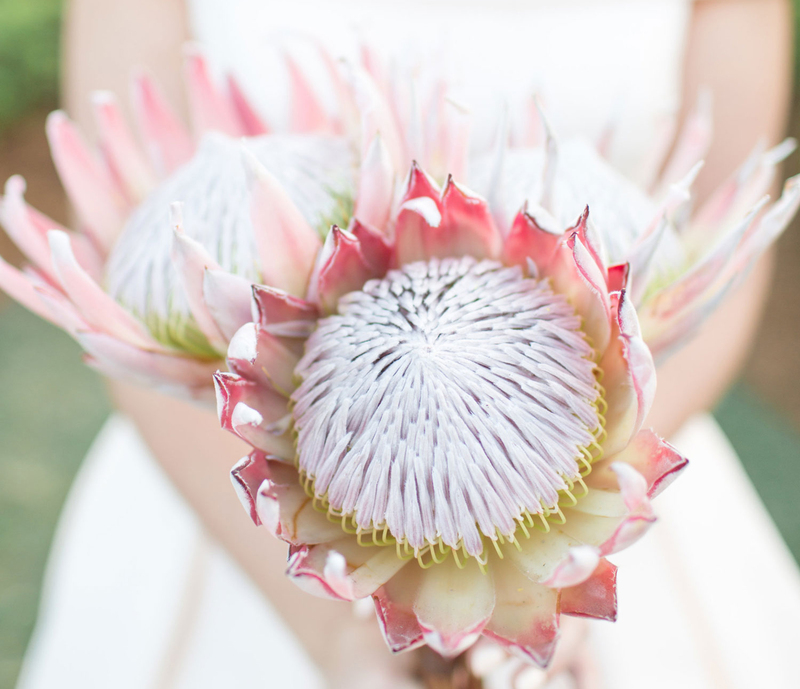 Protea blooms (like those shown above) have been a popular trend as of late and work great as a statement flower that won't trigger allergy symptoms. Discover some of the most popular bouquet styles, find out what else to keep in mind while choosing your flowers, and learn how to preserve and display your bouquet.